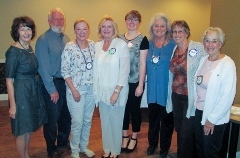 Rotary File for November 3, 2015 | Rotary Club of Iowa City A.M. 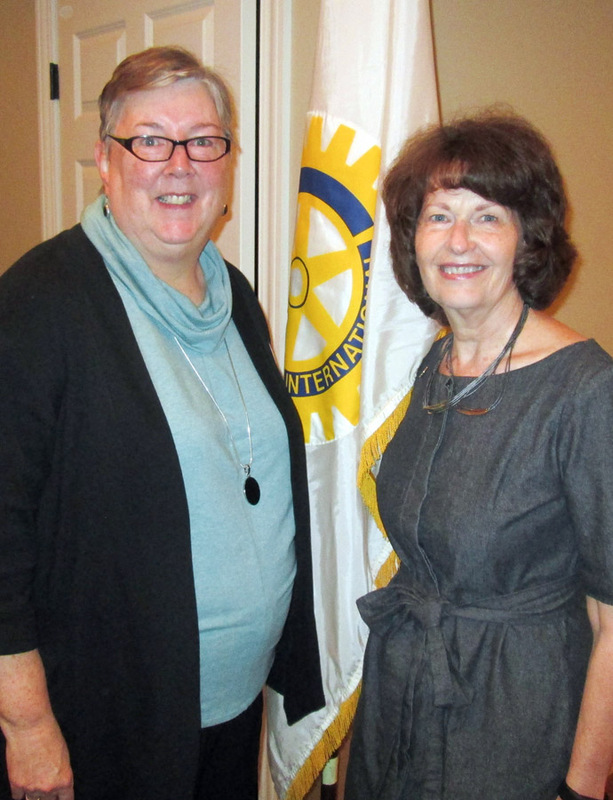 The Speaker for November 3 was Susan Craig, Iowa City Public Library Director who talked about ongoing library programs and some newer ventures for the Library. The meeting was called to order at 7:10 a.m. by President Myrene Hoover. Happy Birthday was sung for the following members with November birthdays: Nenu, Karin and Deb O.
Rotary Foundation Month: give much and give often! Bill Koellner, District Foundation Chairperson made a presentation to honor four new Paul Harris Society members: Kris Ockenfels, Chris Knapp, Vernette Knapp, and Hazel Seaba. The club purchased 19 balloons for the Polio Plus celebration from Happy Buck contributions. There will be a Rotarian as a Polio speaker (part of a Contagion topic at the Global Health Studies), this Saturday at 1:30 at 10W Pappajohn Center. Mark Patton offered up a service opportunity on December 5 (in the morning) giving out Gifts for Parents via the Consultation of Religious Communities. Members are encouraged to sign up for a two hour shift in the morning. Pat Barron shared about his home club in Westchester County, Pennsylvania, and gave our club the flag from his flag. Herb Wilson gave bucks for the new members, Nancy Pacha (same), Brian Adamec announced we exceeded our nut sales level last year, Deb Pullen-Van Aucken spoke about ISU Homecoming and showing sheep, Pat Schnack was happy about being with her grandson, Vernette Knapp thanked members for their prayers for Pete Knapp’s memorial service, John Ockenfels announced his mom’s 85th birthday, Sue Cronin has a new grandson (Malcomb). 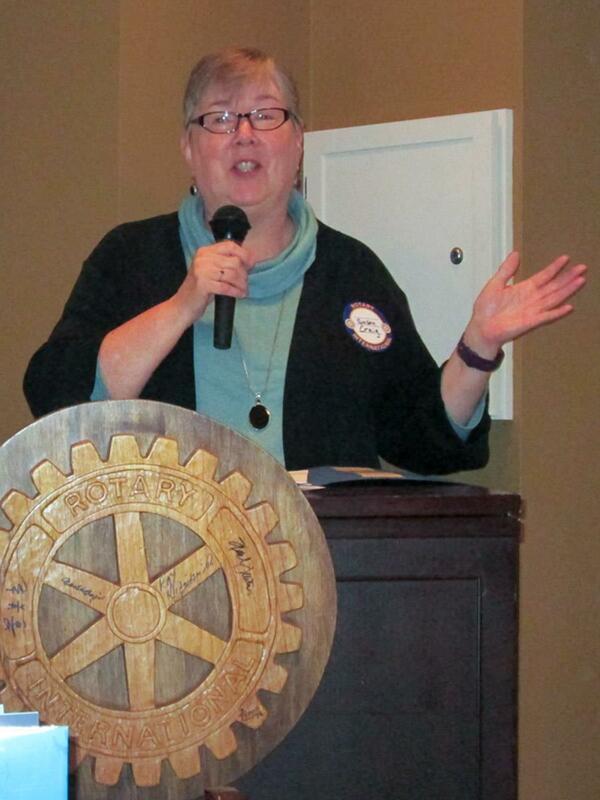 Susan Craig, Director of the Iowa City Public Library was the guest speaker. She has been director for 21 years (started working there in 1975). She spoke on how Iowa libraries are organized: set by state code. Most are municipal (over 500 in Iowa!) libraries. There is nine member library board. One member comes from the rural area. She reports to the board, not the city government. They have a collection of more than 240,000 items with more than 54,000 cardholders. This past year they had more than 800,000 go through their doors (avg. 2200 people per day). Diverse programs at the Library include the Childrens’ Summer Reading Program (and Teens and Adults), including 420 babies and toddlers; 2900 kids ages 3-12. They go out to the schools to issue library cards. They go to Willow Creek Park and Mercer Park in the summer for reading stories out loud and programming for all ages. STEM programming is now running on Thursday nights using electronic devices to learn more about science. The Library relies on sponsors to help underwrite special programming with prizes and coupons. “Music Is the Word” has been organized to welcome the new UI Music School downtown. The “Digital History” project is digitizing written records (for City government, churches, etc) which includes photos as well as the written word. They are also getting ready to recognize the 10th anniversary of the tornado and are requesting sharing of photos of the aftermath. The ICPL has the second most active library for checkouts in the state (Cedar Rapids is #1). Craig was asked when they would build a new building: she does not think anything will happen in the next 10 years. They are looking at bookmobiles. Bookdrops: they are located at UICCU on Mormon Trek and First Ave. Hy-Vee. They take book donations IF they are in good condition. The ICPL Friends Foundation sells used books and made $30,000 last year from sales of the books.